Add This Unit On For Extra Storage Space At School Or Use It On Its Own At Home. Two-Section Coat Locker With Bench Can Accommodate Belongings For Up To Four Children, With Four Coat Hooks And Two Cubbies Above And Below For Storing Jackets, Shoes, Umbrellas, Lunch Boxes And More. Each Of The Upper Two Cubbies Measures 10" Wide X 9-1/2" Deep X 6-5/8" High. The Size Of Each Coat Storage Area Is 10" Wide X 12" Deep X 28" High. Lower Two Compartments Each Measure 10" Wide X 12" Deep X 8-1/2" High And Extend To Offer A Ledge For Children To Sit On. Secure Unit To Wall Using Appropriate Hardware (Not Included)..
Add This Unit On For Extra Storage Space At School Or Use It On Its Own At Home. 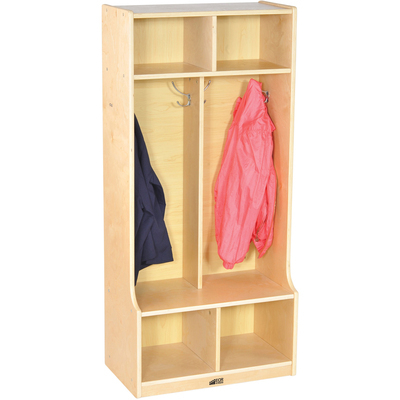 Two-Section Coat Locker With Bench Can Accommodate Belongings For Up To Four Children, With Four Coat Hooks And Two Cubbies Above And Below For Storing Jackets, Shoes, Umbrellas, Lunch Boxes And More. Each Of The Upper Two Cubbies Measures 10" Wide X 9-1/2" Deep X 6-5/8" High. The Size Of Each Coat Storage Area Is 10" Wide X 12" Deep X 28" High. Lower Two Compartments Each Measure 10" Wide X 12" Deep X 8-1/2" High And Extend To Offer A Ledge For Children To Sit On. Secure Unit To Wall Using Appropriate Hardware (Not Included).